hi all of you, in this day i'm here begging you for voting for my papertoy "OSCAR", custom on a Tougui's template for the Posca papertoyz contest. go there and click the like button under the pic. I'm always so happy when I receive a new custom from somebody! Well, ye-boT's are still alive and this is a custom from a good friend by skate, Kristijan Smok. A little late to release, but here is my first mechanical model. I take the opportunity of this post to explain a seriously problem. For those people to cheap to buy a real valentines presents. First tryout build on the Citybot-project. Fountain Whale to the public. I finally got round to do a Custom of my Skateboard Template, Which you can Get Here. This is how my Robotproject looks right now. As you see I have no cool computerprograms and I like seeing it grow "for real" so I draw it by hand. It's just draw, copy, cut out and test, redraw and do it again and again.. When I'm done with the shape I'm gonna scan it and add some patterns and colors in Photoshop. 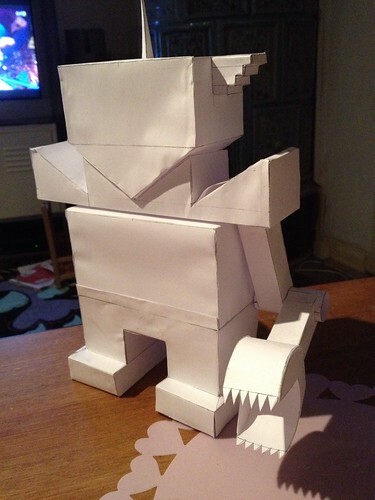 Working on something of my own..
My first papertoy, but of course I can´t do it small.. I'll show ya some pics when I get a bit further..